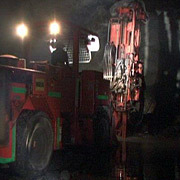 The Lily Mine began as an oxide open pit operation in 2000 which was later developed as a shallow, underground operation. It currently has Mineral Resources of 1.9 million ounces (21.86 Mt @ 2.70 g.t) and Ore Reserves of 0.35 million ounces (4.27 Mt @ 2.60 g/t) in an ore body which extends for at least 2,000 m along strike and remains open-ended at depth to in excess of 700 m below surface. The 2m to 15m wide ore body at Lily is contained within a prominent shear zone situated along, and structurally controlled by, the Lily Fault which defines a major structural break along the northern flank of the Archaean Barberton Greenstone Belt. The shear zone is bounded by talc schist in the footwall and greywacke and banded ironstone (BIF), chert and amphibolite in the hanging wall. Underground development and stoping utilise mechanised, long-hole drilling, blasting, mucking and hauling methods. Ore is hauled with mechanised equipment along specifically sized reef drives, hanging wall drives and ramps. Current access to the underground mine is via a main portal from the old Lily Main open pit, which has been back-filled to the portal elevation at 2 Level. Run-of-mine ore is trucked 6km by road to the CMC, where processing is undertaken in a simple JET-LEACH CIP circuit. The ramp-up to full production of 35,000oz per annum, originally scheduled to be completed in 2012, was delayed mainly due to insufficient capital being available to provide for adequate underground development and mining flexibility. 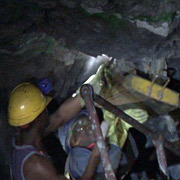 Most of the operational setbacks impeding underground progress in early 2013 have, however, been resolved. 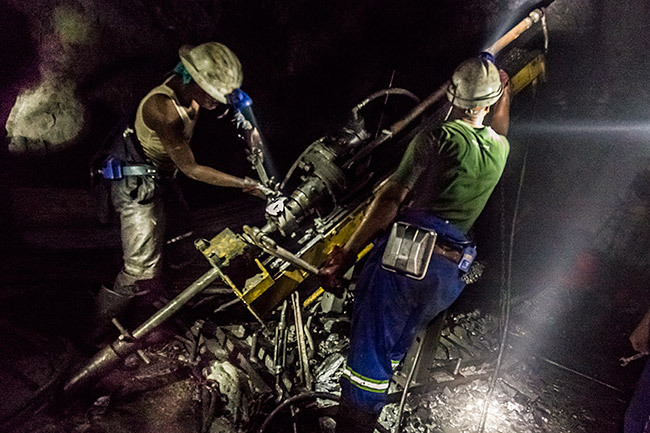 A new stoping configuration and mining plan was engineered, which has led to increased development and improved mining efficiencies, including a reduction of ore dilution to below 10%. 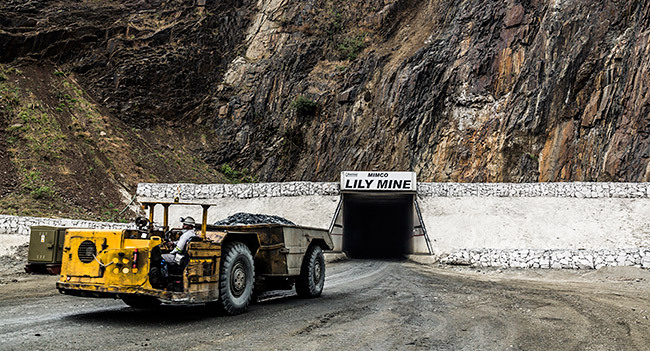 The new mine plan for Lily shows that, over the next three years, production will be derived from two underground areas. The wide ore body pay shoot beneath the backfilled Main pit (Lily Main) remains the priority target for production, while a second spiral decline is being developed in a separate pay shoot to the east (Lily East). This, additional accessibility to the ore body provides for more stoping areas, improving flexibility to manage the run-of-mine production mix.